Contrada Dinner for victorious Piazza! A Contrada Dinner for the winners of the Giostra di Simone takes place in Montisi tonight as the Piazza district celebrates its 20th win. This evening 12 August 2017 sees the Contrada Victory Dinner for Contrada Piazza taking place in their district here in Montisi. They won the competition in last week’s Giostra di Simone for the 20th time in the history of the competition and the entire district is very excited to continue their celebrations this evening. 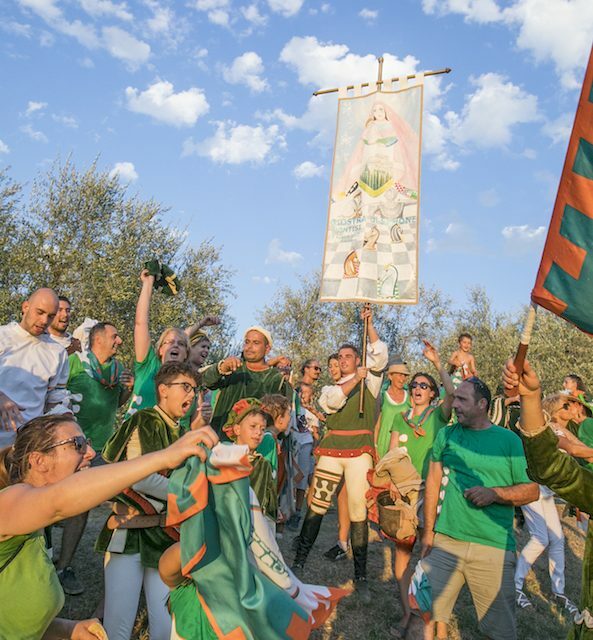 Montisi is bedecked with flags throughout the village for our Giostra festival but tonight there will be lots of green and orange, the Piazza colours. There will be a huge dinner cooked by the locals and served by the locals washed down by a good deal of red wine! They will also enjoy a magnificent slide show and will be making a lot of noise! Congratulations Piazza and enjoy yourselves! All of our Contrada (district) dinners are open to locals and to visitors and anyone enjoying a holiday in Tuscany is very welcome to come and join in our festivities.